For some unknown reason the Scandic nations rule when it comes to rock bands. Now I don’t know if it’s the lack to daylight hours which makes ‘em all a bit loopy, or if its the equivalent of National Service whereby at the age of 18 it is compulsory to start a band. For some reason the genre of melodic/aor is right up their gata/gaten (too much watching Wallander). So, being trapped in the musical equivalent of ‘The Power Hour’ where this once great TV program is still current and topical in Scandinavia, Xorigin have tapped into this stream of spandex, multi-layered keyboards and harmonies. God bless them for that. I say that with all sincerity as I love AOR!! 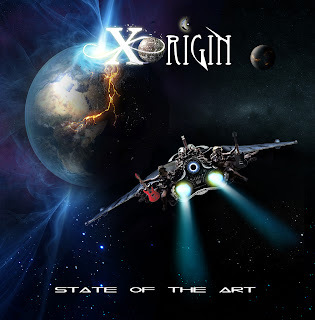 Melodic hard rock with a modern edge would be a fitting description of Xorigin's music. Musically they draw on influences such as Giant, Toto, Foreigner and Yes to name a few, but still keeping their own personal sound and musical identity intact. They have strong melodies, well crafted songs and catchy vocal arrangements as a trademark. The band was originally named Orange Crush (so no bleedin’ wonder they changed it!!) and was formed in Los Angeles in 1999, while the members where studying music at the Musicians Institute. Like a Miners Institute, only for decrepit musicians. The founding members Johannes Stole (vocals) and Daniel Palmqvist (guitar) later returned to their home countries of Norway and Sweden and continued collaborating on various projects in between their other engagements. Johannes is a sought after session singer/artist in Oslo, Norway and has released a critically acclaimed album with progressive rock band P:O:B. Daniel has released a well received instrumental solo album and is also the guitarist for the band The Murder Of My Sweet. Again not the best name in the world. Sweet? Humbug, parma violet, love heart, what?? Tracklisting: Can´t Keep Running; Crying For You; In The Blink Of An Eye; Too Late; Gina; This Is It; The One For Me; Said And Done; Matters To The Heart; What Love Is All About; Mend My Heart.